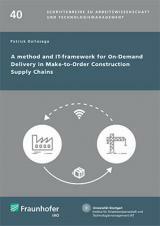 In this thesis a method and a suitable IT-support for on-demand delivery in Make-to-Order (MTO) construction supply chains (SCs) is presented. The methodology is applied and validated in three industrial case studies. A compendium of 10 guidelines is presented for a wider practical application. In the last part, the requirement analysis and specification for the development of a software for supporting construction project management according to the developed methodology are presented. The author developed both the methodology and the IT-framework while working at the "Fraunhofer Gesellschaft". In particular, the basic model defined as the "PRECISE" production system, was developed during the research project "build4future". The detailed steps, "Process Planning", "Pitching", "Synchronization" and "Definition of the customer demand" were developed within directly commissioned research projects by the company Frener&Reifer GmbH (Italy) and TMP Fenster + Türen GmbH (Germany).